A delicious frozen conspiracy of Coffee and Irish Cream liqueurs, vodka, and a touch of ice cream frappe. Topped with whipped cream and a chocolate swirl. Test the barkeep on this one. 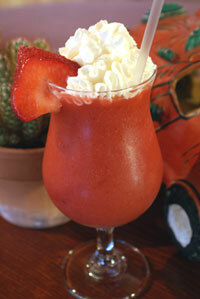 A tall, cool rum and fruit drink. Made from a variety of disturbed spirits and special potions that actually taste just like what Aunt Eunice served on the back porch… in a cowboy boot glass. Made with dark rum, pineapple and coconut cream. Served frozen. 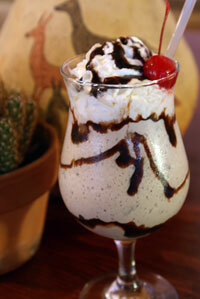 Made with dark rum and blended to a creamy texture; topped with whipped cream. Choose from: banana, strawberry, peach, mango or raspberry. Sam’s had the wind blown out of his sails more than once with this tasty treat. A refreshing mix of coconut Rum, triple sec, pineapple, and cranberry juices. Served in a tall hurricane glass.